the family that plays together…. 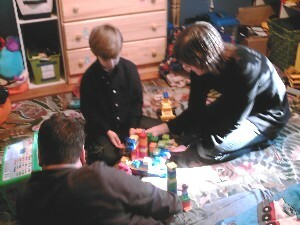 It’s the day before Thanksgiving, and they sit on the floor of his sunny bedroom and build Lego towers. He’s got parents who play with him. I don’t remember my parents ever doing that with me. He helps them set the Thanksgiving table for the nine people who will gather for the family dinner. 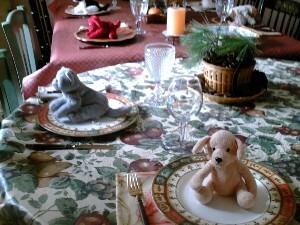 He wants to add something of his own at each place setting. What a great idea, they tell him. I don’t think I would have been allowed. Now, I’m sitting here blogging while my mother is sleeping. I dressed her, fed her, cut and filed her fingernails, and that was about all she could take. Her nails are dry and brittle, and they crumble when I cut them. She sleeps a lot. Eats little. She’s always stroking something — my arm, her knee. She needs to touch. Keep in touch. She’s afraid. We all know what she’s afraid of. This is not play. This is not fun. I try to make her smile. I try.